A fully illustrated reference book featuring period photos and photo of contemporary restorations. A Visual History of the U.S. Army's Mid 20th Century Battle Tank The M48 series of Medium Tanks formed the backbone of America's armored force from the close of the Korean War, throughout the Cold War and onto the sands of Iran. The classic silhouette of the M48 is instantly recognizable to Veterans over a period of four decades, beginning with its development in 1950. 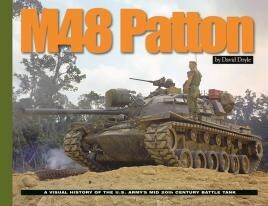 This book is the ultimate general guide to the M48 series tanks. Combining historical imagery with superb walk-around images, the title explores all the fielded variants of the M48 series—starting with the T48 and continuing with the M48, M48A1, M48A2, M48A3, M67A1 and M48A5. No detail is left uncovered within the hundreds of clear, color photos. This title is a "must have” for anyone with an interest in modern armor, or the modeler building any of the three plastic kits currently available.